YR is dedicated to providing buyers with high quality products and premium service.Please feel free to contact our customer service if there's any problem. About the Product: The fastest way to keep condensation from forming in your decanter after washing.Keeping your countertop and table clean and dry.The Multi-Purpose cleaning brush is Flexible,Soft and long enough to clean the dust, dirt on the bottom of the glass. Warranty: 3 months money back and life time services guarantee. Please fell free to contact us if you have any questions. Decanter Drying Stand:Air dries your decanter for a spot-free finish. Wooden Drip Tray:Holding the drip,keeps your countertop clean and dry. Silicone Tip: Protects the decanter from scratches and slipping. 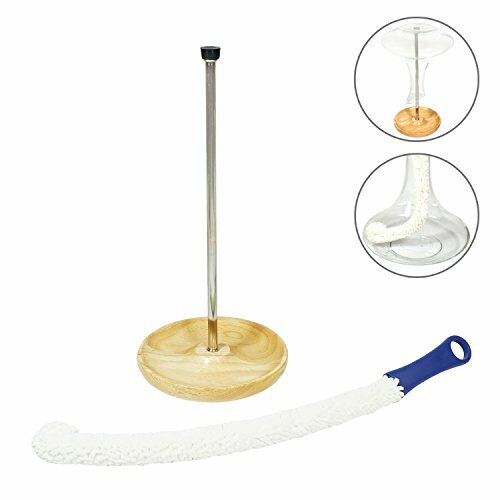 Multi-Purpose Cleaning Brush:Perfect for narrow neck goblets, decanters and different kind of bottles. If you have any questions about this product by YR, contact us by completing and submitting the form below. If you are looking for a specif part number, please include it with your message.